If history is the story of man’s struggle for betterment, then protest music is the soundtrack to that struggle. 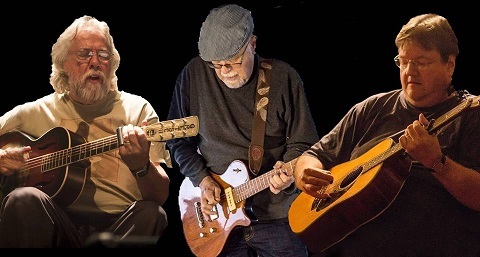 Multi-instrumentalist Richard Haslop, veteran bluesman Will Wallace and folk musician Mike Raftery join forces again at the Rhumbelow Theatre (Tina’s) in Kloof from October 12 to 14, 2018, to present Chimes of Freedom – Songs of Protest, Persuasion & Politics. Whether grabbing attention, entertaining the people or upsetting those with a guilty conscience, protest songs have always reflected and sometimes even influenced the changing times. Armed with seven instruments – acoustic and electric guitars, dobro, mandolin, resonator, weissenborn and bouzouki - this unique trio will present powerful songs - some familiar (Bob Dylan, Bruce Springsteen, Paul Simon) and some that just have to be heard, ranging from the 1700’s Jacobite rebellions to today’s Brexit headlines.